I got a 1981 Gousha US atlas the other day, and I've found some things that surprised me for being so relatively recent. Just wanted to illicit some discussion and possibly learn some things. Highway 1 Pacifica Bypass: There's a dashed line making a more or less straight line from the end of the freeway section north of Pacifica to right by the Half Moon Bay Airport. Obviously this is partially the Devils Slide region that had been a proposal for a very long time. Was this a larger proposal in the same vein? I can't find much on it by Googling because Devils Slide tunnel articles just pop up. I-980 incomplete at Nimitz Freeway: The last southern bit of I-980 is shown as a divided highway instead of a freeway. I vaguely recall seeing this on other maps from the early 80's. Was that just because there was an at-grade interchange with the Nimitz Freeway? In LA, the Reseda Freeway is shown as proposed. I was just surprised that it was shown so late in the game. In Huntington Beach, there is a proposed bypass of Highway 1 around Bolsa Chica, starting at the southern boundary of the Seal Beach Naval Station. What is this? "Temp I-15E" is still shown on the California map. Again, it just seems like it's a bit late. Meanwhile, the most southern section of SR 15, north of I-5 to the last gap in Normal Heights, is marked as I-15. I would guess that as just an error, or maybe optimism. (1) The Pacifica-Half Moon Bay bypass was a longstanding adopted freeway route along CA1; quashed by 1982 jointly by Adriana Gianturco, the largely anti-freeway head of Caltrans at the time and the then-nascent California Coastal Commission. Essentially all adopted freeways along CA 1 were deleted between 1976 and 1982; existing facilities were "grandfathered" in. The later Devil's Slide tunnel bypass was simply to keep CA 1 open between Pacifica and Half Moon; the original cliffside route was considered too unstable to maintain. (2) Until the connecting ramps to I-880 (then still CA 17) were constructed, I-980 emptied out into a one-way street couplet; that is what is likely depicted on the map. (3) I'm surprised this CA 14 extension was shown; it was never an adopted route, always simply a corridor concept. The fact that it would have intersected CA 1/PCH near Pacific Palisades (prime NIMBY country!) probably doomed the concept from the start. AFAIK, it's still a line on a map, with no plans to adopt or construct. (4) Partial explanation, see (1) above. The "Pacific Coast" freeway concept through Long Beach was deleted about 1978 by the CTC on the advice of Ms. Gianturco. It originally was to follow the western section of CA 22 (E. 7th Street) east to the present 405/605/22 interchange complex, then turn south from there, skirting the wetlands inland from Seal Beach, and pass by Huntington Harbor to the then-proposed CA 39 freeway, which extended due N-S between Beach Blvd. and Golden West Avenue. That route, along with the adopted section of the CA 39 freeway between CA 1 and I-5 near Buena Park was deleted soon after the Long Beach segment. The CA 1 freeway would have veered inland near Fountain Valley, and would have intersected CA 55 in Costa Mesa right about 19th Street, where the current CA 55 freeway ends. Curiously, the original projected path east of there is similar to the present location of the CA 73 toll road; both closely bypassed UC Irvine to the south of campus. (5) Since I don't have a copy of the '81 map handy, I'll take a guess that the "Temp I-15E" sign is located somewhere along former US 395 between Riverside and Temecula. Since I-215 was not commissioned until the following year, that was probably accurate at the time. It's likely that the San Diego I-15 signage on CA 15 is simply an error. I'm wondering if they just looked at the Caltrans map and picked and chose what they would add, because 118 is also shown just north of that, with the same type of dash. However, 118 got a shield and a "PROP." But I don't know what's more ridiculous: the Reseda Freeway or the Embarcadero/Golden Gate Freeway. (4) Partial explanation, see (1) above. The "Pacific Coast" freeway concept through Long Beach was deleted about 1978 by the CTC on the advice of Ms. Gianturco. I may have to scan this then, because the proposal is only shown from Seal Beach on the west, paralleling the coast, and it strangely turns south to closely parallel Beach Boulevard before ending at SR 1, just west of it. I would say "pick and choose" again, but I can't imagine they pulled that one out of their collective butts. Unfortunately the LA area inset map cuts off just west of Corona, so I can just see that one shield. I'd be interested to see where they decided to sign it on this map, since they took a number of other liberties. All the way to Riverside? Past Riverside and back up 60? There are a lot of other really odd things on this map in other parts of the country. It seems like either someone was creative, optimistic or maybe just a bit careless. I need to stop buying these small-scale maps and would maybe get better quality, but it would be less interesting if Route 66 didn't appear randomly in Arizona because someone forgot to erase it. The original proposed routing of the CA 1 freeway was indeed odd, likely because the portion between the 405/605/22 interchange and CA 39 needed to avoid Huntington Harbor; it stayed well inland. When it intersected the CA 39 freeway alignment, it turned south following the CA 39 trajectory for a mile or so before turning SE again to parallel PCH -- but slightly inland to avoid (a) the wetlands immediately north of PCH and (b) the Edison power plant in SE Huntington Beach. Prior to the mid '70's, when the deletions took place, the CA 1 adopted alignment in L.A. and Orange counties was hardly linear in nature; it twisted around to avoid obstacles along or near its projected alignment (refineries in Torrance and Wilmington, business districts and CSULB in Long Beach, Huntington Harbor and the more densely-developed parts of Huntington Beach, etc.). It was almost as if it were routed by a committee and designed to minimize NIMBY objections. Since it largely paralleled I-405, which was only 4-5 miles inland, the fact that there was an adopted routing at all serves to illustrate the clout of the old Division of Highways' planning efforts in the '50's and '60's; the CTC, in those days, largely followed the Division's lead -- if the planners & engineers wanted to build something, they did get their way more often than not on a statewide basis (even with political issues surfacing in more urbanized areas). It would not have been terribly difficult to get a CA 1 freeway adopted in the more industrialized areas of L.A. county as well as the decidedly conservative Orange County area; a clear path from concept to deployment was likely projected. But when Caltrans itself went "rogue" under the Gianturco leadership in the mid-'70's -- and the Coastal Commission began to scrutinize projects within its jurisdictional zone, adopted routes like the CA 1 freeway started dropping like flies! Yes, that shows the route that sparker described, but the map I'm looking at shows it only starting at the southern boundary of the Naval Weapons Center. There's no connection to SR 22. So I would guess that the Navy objected to the thing running across their property, or this was an early environmentalist objection, because the Navy's property is now an important wetlands. It's just interesting to me that someone thought it prudent to leave a bypass of Downtown Huntington Beach on a map somewhere. Interestingly, the original route that was formally adopted in the '60's showed the adopted route directly south of the 405/605/22 interchange as CA 240; it is unclear if CA 1 was to remain on PCH between CA 22 and CA 240 -- or whether any conceptual freeway corridor paralleling PCH was under study or discussion; no map ever showed a future alignment anywhere near that section of PCH. It would have likely been a non-starter in any case, since it would have passed through Belmont Shores, a proverbial "poster child" for upscale NIMBY activity. This arrangement was different by 1971, when CA 243 (the original designation of the northern extension of I-605 between I-10 and I-210) was added to the Interstate system that year while the extension was under construction (it was never signed as anything but I-605); CA 240 also disappeared that year, replaced by CA 1. The original adopted route did pass through the USN facility, which at that time contained the wetlands yet to be protected by the future Coastal Commission. But any activity toward development of this alignment was dead by the late '70's (Gianturco + Coastal Commission = no new freeways anywhere near the coast). It's probable that the section through USN land was never formalized by an agreement between the two entities (USN & the Division of Highways), so it was likely left off the '69 state map until such an accord could be reached -- a point made moot by the overall route deletion a few years later. The '81 map's depiction of the corridor was likely due to mis-or non-communication between the Gousha researchers and state agencies, since by that time the deletion of both the CA 1 and CA 39 freeways had taken place. The whole notion of deploying a freeway through USN territory, coastal wetlands, and anywhere in the vicinity of Huntington Harbor (aka Yacht Central!) always, at least to me, seemed to be an exercise in futility. Even before the mass adopted-route deletions of 1978-82, I thought that the only viable freeway arrangement in the area was to let traffic remain on I-405 to the CA 39 freeway alignment, and take it down to/near the beach from there. Obviously even that concept would have been dead meat by the end of the '70's. This arrangement was different by 1971, when CA 243 (the original designation of the northern extension of I-605 between I-10 and I-210) was added to the Interstate system that year while the extension was under construction (it was never signed as anything but I-605); CA 240 also disappeared that year, replaced by CA 1. It seems likely that it would have been signed as SR 1, however. I'd disagree with this - the route is more linear through Wilmington and Long Beach than I-405 in this area. it is unclear if CA 1 was to remain on PCH between CA 22 and CA 240 -- or whether any conceptual freeway corridor paralleling PCH was under study or discussion; no map ever showed a future alignment anywhere near that section of PCH. It would have likely been a non-starter in any case, since it would have passed through Belmont Shores, a proverbial "poster child" for upscale NIMBY activity. From a study the City of Long Beach did in the mid-'70s regarding this corridor (in which they recommended the Division of Highways drop the proposed freeway route), CA-1 would have used the CA-240 corridor. That said, an alternate routing that used the PCH corridor between 7th Street and Seal Beach would have been feasible, since there was almost no development along that corridor until the mid-'70s. In any case, no potential corridors actually go through Belmont Shore, so I don't see their NIMBY-ism being an issue. The housing in Belmont Shores was indeed south of PCH, but PCH itself was lined with commercial establishments -- restaurants, hotels, etc. dating back to at least the late '50's and early '60's; an old college GF and I used to go bowling in lanes located at the corner of PCH and 2nd Street (which turned into Westminster Ave. east of PCH); this was back in 1969-70. It's likely any potential freeway corridor would have paralleled CA 1/PCH just inland of the existing route; that would have taken out a couple of trailer parks and older housing stock south of 7th Street and CSULB; it is also likely that a route like this could possibly have been squeezed in between PCH and the USN armory, only taking a sliver of land from the federal reserve. The only real obstacle would have been the wetlands at the mouth of the San Gabriel River (winter outflow from the river, like the LA river to the west, largely a flood-control channel in the flatlands, didn't reach the ocean due to sandspits, but instead fed those wetlands). The commercial strip along PCH extended for about 3-4 city blocks SE of the 2nd/Westminster intersection and abruptly ended with a PCH/CA 1 overpass over a naval base rail line that extended to a group of piers along a dredged inlet located where the San Gabriel River would have flowed into the ocean if not for the sand buildup and subsequent water diversion into the wetlands north of PCH. The piers served, during the Vietnam war years, as a loading site for munitions heading for the South China Sea (with, on some weekends, small cadres of war protesters lining PCH along the overpass). I don't recall seeing any indication (in the usual form of a row of circular dots) of any planned or even conceptual cutoff paralleling CA 1 between 22 and the original CA 240 route heading south as a virtual continuation of the I-605 path. While the CA 1 alignment through Long Beach and Wilmington was pretty much due E-W, at its western end it curved north to avoid Palos Verdes (another NIMBY stronghold! ), threading the needle between PCH and the massive Mobil refinery between Western Ave. (CA 213) and Crenshaw Blvd. in Torrance. Rather than draw the ire of coastal residents in Redondo Beach, the freeway facility left the CA 1 corridor east of Hawthorne Blvd. and became a freeway segment of CA 107 north to a terminus at I-405 near Lawndale. That, too, was deleted along with the Long Beach section by 1978. Marina Pacifica, Long Beach Marketplace, everything between 7th Street and Cerritos Channel - none of that exists yet. Even by the 1972 picture it's still pretty empty. But as you say, I haven't seen any proposals using this corridor. You can also see in those pictures how the Crosstown section would go - on the 1972 layer, in between the housing and the temporary CSULB parking south of 7th Street (which is why 6th Street curves the way it does in that neighborhood) - paralleling Colorado Street to the south, then the Pacific Electric ROW across 7th Street/Ximeno Avenue towards 10th Street/Anaheim Street. Yes, it curved north, but wouldn't that more a matter of topography than NIMBY-ism? Sure, you could go up Palos Verdes Drive North, but then you'd have to come down at some point via one of the canyons (Crenshaw, Torrance, PV Boulevard) - it seems like it would make more sense to pick a much flatter, straighter alignment less than a mile to the north (I worked for years with some of the "old guard" in PV - I heard a whole lot about their history and politics). http://cahighways.org/maps/1956-la-mteb2.jpg while the Pacific Coast Freeway still continued up along the CA-1 corridor (although again, this was abandoned by 1970 or so). The fact that the CA 107 freeway was informally referenced as the "Hawthorne" freeway rather than the "Ocean" or "Pacific Coast" nomenclature variously tossed around at the time as the colloquilal name for the CA 1 facility does not change the layout of the freeway route; it was clearly intended for westbound CA 1 traffic to segue directly onto CA 107 if they wanted to remain on a freeway. Whether the N-S freeway would have been solely signed as CA 107 or augmented by auxiliary signs (particularly SB and on the approach signage from I-405) as "TO CA 1" is at this time both an unknown factor and a moot point considering the deletion of the routing 38 years ago. One of the corrolary aspects of areas with an outsized level of NIMBY activity is property valuation. DTC is basically correct regarding the topography of this area; North Palos Verdes runs along the northern base of the Palos Verdes hills; to the north is a wide alluvial slope that flattens out a bit south of PCH/CA 1. That alluvial contains large-tract properties; it is zoned for horse ownership, so those with the means to afford horses as well as the sizeable properties required to stable and maintain them have flocked to this area (it's generally a lot cooler than most of the L.A. basin in summer). It's not only prime NIMBY country, but the properties here are also much more expensive to acquire. The decision to veer the proposed CA 1 northward west of Vermont Street and more closely parallel PCH was likely resultant from a combination of topography, finances, and the desire to avoid opposition/complaints from folks with the outsize capability to make their case heard -- and with a better-than-average chance of getting what they wanted. It's likely closely related to the choice not to project/propose a freeway routing closer to the extant CA 1 alignment through Redondo, Hermosa, and Manhattan Beaches. I lived (albeit a mere apartment-dweller) in Manhattan Beach from 1973 to 1975, about 9 blocks inland from the beach. The homeowners in the area seemed to be uniformly incensed whenever changes to their environment were suggested. They even complained when the twice-weekly Santa Fe branch line freight service to a lumber yard in neighboring Hermosa Beach altered its schedule from early morning to mid-afternoon to avoid blocking streets during peak hours -- complaining that the noise disturbed their kids' nap times (well after I moved away from the area, the tracks were abandoned). Deploying a freeway paralleling Sepulveda (CA 1 alignment in the area) would have been a non-starter. Bowing to the obvious, the Division of Highways, and later Caltrans, likely followed the cliched advice of: "Doctor, it hurts when I do this!"..... "Well, don't do it!". 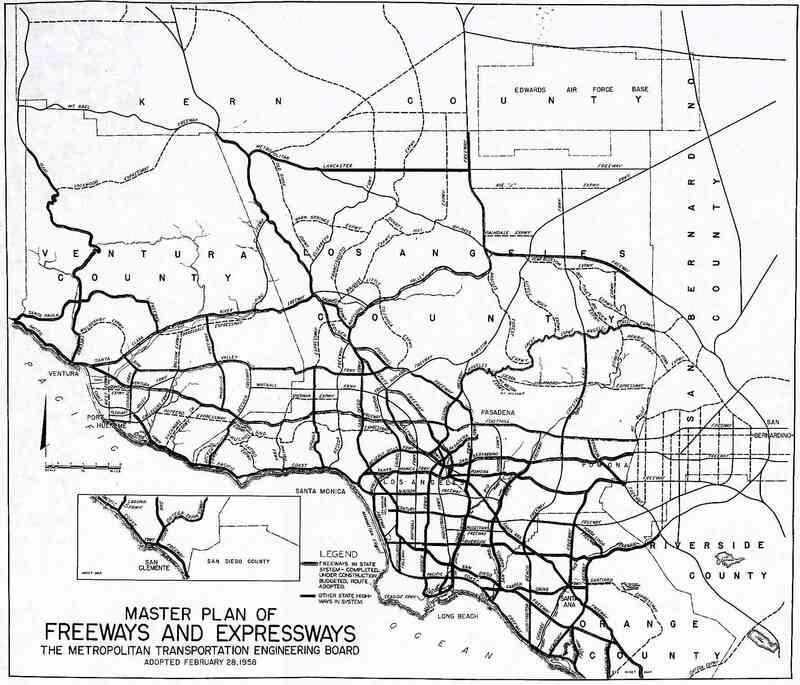 Even though they had their master 1959 freeway & expressway plan (with some significant '65 revisions), they had learned to choose their battles carefully -- avoiding planning facilities where they weren't wanted -- particularly where those objecting had a good chance of prevailing! Manhattan Beach doesn't seem to have changed much in attitude. I think if the Kettle threatened to close, there would be massive fundraisers among residents to try and keep it open. Though, since it's one of those places where you're supposed to eat, it'll probably never close. Topographically, it just doesn't make sense to have routed a Highway 1 freeway through the Palos Verdes hills. It's invariably more expensive to build a highway over hilly terrain than over mostly flat terrain. So that path of least resistance would have theoretically applied in two ways: resistance from landowners, and topographical resistance. I think it's also interesting to point out that the freeway would have almost certainly had to plow through Lomita, which is another insular, conservative city, that was incorporated in 1964. I only mention that fact, because incorporation is often a tool at fighting something proposed or active within your new boundaries (Sand City, right by me, was incorporated to stop a landfill from growing). It looks like the Torrance Oil Field - which divided Lomita and Torrance - stopped production sometime in the 60's, so that would line up with everything, it seems. I'm not suggesting that it's all connected, but it's somewhat coincidental: Lomita incorporates just as the oil fields shutter and a new freeway plan shows up at their doorstep. An oil field is certainly an easier place to build a freeway than a subdivision. I also should mention that I was wrong about the Reseda Freeway being shown: the 1981 map in question shows SR 64, the Whitnall Freeway, as proposed. I had always thought that was the Reseda Freeway, but the north-south SR 14 corridor more earns the name since it mostly paralleled Reseda Boulevard. I was a Kettle regular during the time I lived in Manhattan Beach -- very much liked the idea of getting a Spanish omelet at 3 AM! (something that occurred too often, I'll admit!). Renewed my familiarity with the place in the '80's, when a friend who was an engineer got a job at Hughes in El Segundo and ended up moving to Hermosa Beach. By the time I got down to the area to pay him a visit, he had already discovered the Kettle (pretty much everyone from Hughes ate there regularly!). I wouldn't be surprised if one day that place gains status as a historical landmark! One of the principal obstacles to the east-west CA 1 freeway through the Lomita and south Torrance areas was the presence of the Torrance Airport along Crenshaw Blvd. ; it, along with Hawthorne and Santa Monica airports, was one of the main "bases" for corporate jets owned and/or used by the local aerospace industry -- and as such, had virtually sacrosanct local status. Any freeway in the immediate area would have had to limit any vertical aspects of deployment, such as flyovers, high berms, etc. so as not to be construed as interfering with airport operation. IIRC, the CA 1 freeway routing skirted the southern end of the airport just north of PCH. I don't recall that any construction plans were ever publicly available, but I would guess that the freeway would likely have been sited below grade along that stretch, so any interchanges with intersecting streets would not rise significantly above ground level.